Habit: Shrub, unarmed, gland-dotted. Leaf: odd-1-pinnate; stipules bristle-like, ephemeral; leaflets with minute stipule-like appendages. Inflorescence: raceme, spike-like, terminal. Flower: petal 1 (banner), +- purple; stamens 10, exserted, filaments fused near base; style puberulent. Fruit: indehiscent. Seed: 1. 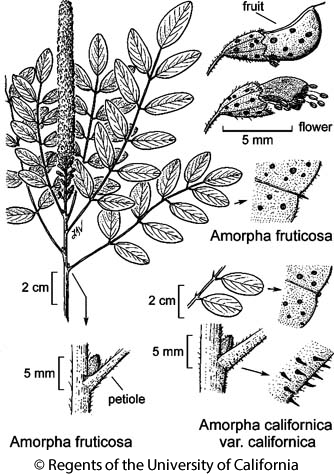 Leaf: main axis with prickle-like glands; leaflet midrib generally ending as sessile, head-like gland <= 0.5 mm. Inflorescence: generally 1 per stem tip. Chromosomes: 2n=20. Habit: Plant hairy. Flower: longest calyx lobe (except gland at tip) 1--2 mm. Citation for this treatment: Steve Boyd & Duane Isely 2012, Amorpha californica var. californica, in Jepson Flora Project (eds.) Jepson eFlora, http://ucjeps.berkeley.edu/eflora/eflora_display.php?tid=53916, accessed on April 24, 2019. KR, NCoRI, n SNF, ScV, SCoR, SCo, TR, n&e PR. Markers link to CCH specimen records. Yellow markers indicate records that may provide evidence for eFlora range revision or may have georeferencing or identification issues. Purple markers indicate specimens collected from a garden, greenhouse, or other non-wild location.